I enjoyed this post though I don’t know if I’ll start watching the show. I didn’t know that Green Arrow was traditionally a politically left wing character even in the 70’s. I thought Frank Miller had added that to contrast him more sharply with Superman in Dark Knight. I guess that makes sense if he’s supposed to be a modern day Robin Hood. I was always more of a Marvel fan and was never sure how they could come up with a plot every week for guys like Green Arrow. Where did you get those great images from the comic books? I know what you’re saying about not wanting to take a chance on a new show until they get renewed for a second season. It’s so frustrating getting invested in a show and having it cancelled just as the story really gets going. I think the networks are actually shooting themselves in the foot in the long run with mid season cancellations. Why get invested in any show if you never know how long it will last? You mentioned the old-fashioned monster/villain of the week format. I think that’s usually a safer bet for networks because than the episodes can stand on their own in syndication. You can really get into a serial narrative like Lost, but it doesn’t work so well to just sit down and watch one random episode. But some shows (like Buffy) do a good mix of alternating the monster of the week with an episode that advances the ongoing storyline of the season. I am trying to get into Agents of Shield now. Eh, it’s ok. I really liked Whedon’s Avengers movie (and the other super hero movies linked to it) but the show has too many generic CSI crime show cliches for me. The evil villains with super powers have been pretty cheesy so far also. Yeah, I’m a little disappointed in Agents of SHIELD. I think Joss is off doing bigger things and applying a light touch on the series. That’s not to say that other people can’t try and improve the writing so far. Wheedon is wonderful, but he’s not the only person capable of wit and strong characters. I think Arrow has a ton of potential, much of it still untapped. But their choice to make the hero a work-in-progress, and also their choice to make him start at the moral bottom – a pretty brutal vigilante at the beginning – give the story someplace to go. I think its resonances with Buffy are what have attracted me to the show (and maybe the abs . . .). I do think they need to get out of some of their writing ruts. Many of the themes about secret identities from season 1 seem to be continuing unchanged in season 2. There are new dimensions of the mythos to be explored. 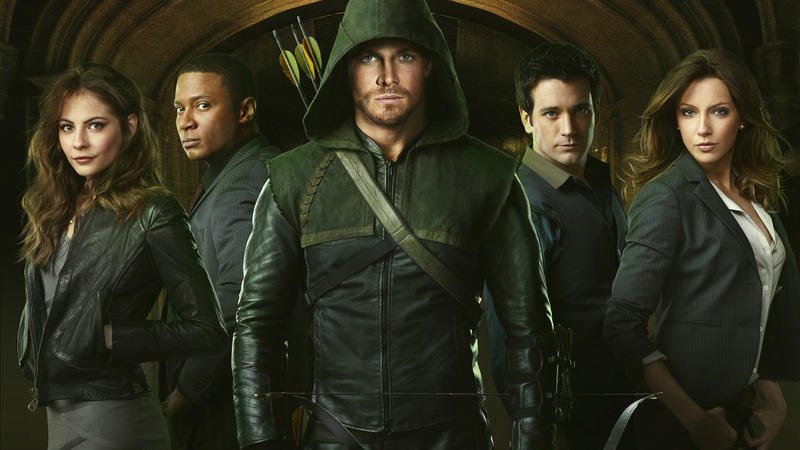 The ensemble cast is strong, In addition to Amell, Paul Blackthorne (who played Dresden on the ill-fated Dresden Files) as the police detective with conflicting feelings about vigilantism; Willa Holland as Thea, Oliver’s spoiled but wise sister; and Emily Rickards as Felicity Smoak, the Arrow’s nerd girl ally are particularly worthy of note.